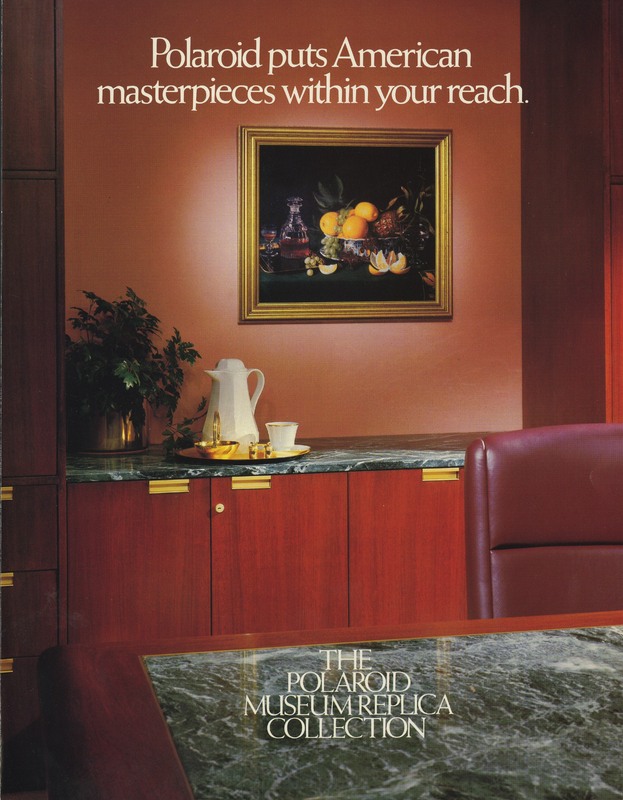 Museum Replica Collection product information, circa 1980s. Polaroid Corporation Administrative Records, Baker Library, Harvard Business School. 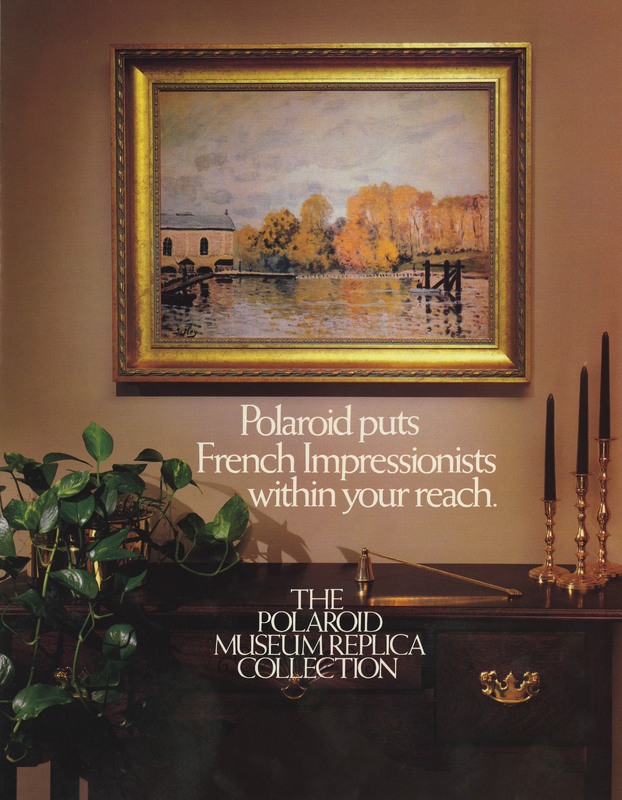 In addition to its collection of French Impressionist paintings, offered in partnership with the Museum of Fine Arts in Boston, Polaroid sold prints of American paintings. Polaroid also offered a custom, on-demand replica service to those who coveted a particular image (as long as they asked the museum for permission, and paid a royalty). It was thought that this would also be popular among private collectors who wanted a placeholder in their homes when lending works to institutions. The 20 x 24 and the Museum Camera could be seen as fraternal twins: both were born in 1976, and sprang from abruptly announced desires of Polaroid co-founder Edwin Land ’30, S.D. ’57. The former was invented when Land decided that he wanted to juice up the 1976 shareholders’ meeting, upstaging one of the company’s hot new products—8-by-10-inch film for professional photographers—with an even bigger camera. The latter was made for a more specific, if no less whimsical, purpose: the boss wanted a life-size replica of a Pierre-Auguste Renoir painting held by the Museum of Fine Arts (MFA) in Boston. 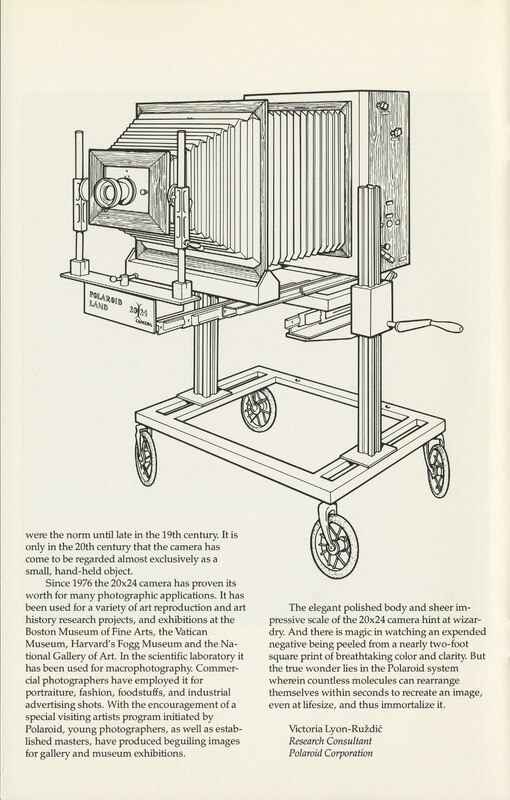 From its beginning, then, the uses of the Museum Camera were obvious: to produce life-size, high-fidelity copies of artworks, first for scholarly study (and the associated prestige), and then for profit. In 1980, the company made headlines—and The Guinness Book of Records—when it rigged a Vatican gallery with equipment to make the largest box camera ever constructed, a super-sized version of the Museum Camera, in order to photograph Raphael’s Transfiguration of Christ. And in 1989, it partnered with the Moscow Tertryakov Gallery to make a series of Polaroid reproductions for a touring show, “Treasures from Russia,” that showed works like Andrei Rublev’s Old Testament Trinity outside the Soviet Union for the first time. Eventually, the camera was monetized through the Polaroid Museum Replica Collection, which sold limited-edition, museum-authorized prints, starting at $395. Each came with a Polaroid certificate of authenticity. Its smaller sibling, the 20 x 24, had a more uncertain status. Official Polaroid pamphlets would later assert that “it began as a research tool to accurately reproduce works of art”—and it’s true that, early on, the camera was employed to take detail shots of a medieval tapestry at the MFA that were then sent off to Harvard, Yale, Cornell, the University of Chicago, and UC, Berkeley. But as documented by papers in the Polaroid Corporation Records at Harvard Business School’s Baker Library (see Treasure, “The Polaroid Moment,” March-April, page 76), the corporate vision was hardly that clear. The 20 x 24 existed, and the company had to dream up its purpose after the fact. Today, it’s considered an artist’s tool. Back then, it was a product in search of a market. That year, the company constructed four cameras, with plans for three more. But they cost about $50,000 apiece—before operating expenses. Polaroid determined that each camera should be attended by two full-time staff members: a “back man” who took care of the film supply, mechanics, and logistics, and a “front man” devoted, essentially, to promotion. He’d be “the synthesis of a sound businessman and an excellent photographer”—someone who “knows who the photographers of importance are…convinces them to try using a 20 x 24, and guides them to having a very successful first experience.” It was thought that Polaroid might even need to offer a “picture perfect guarantee” to coax early adopters into their new Cambridge studio. 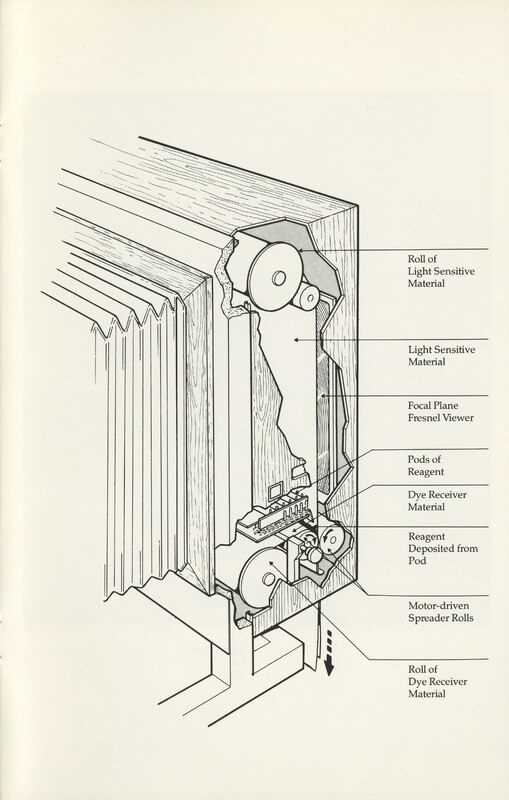 As scholar Peter Buse points out in his book The Camera Does the Rest, for many years Polaroid’s public-relations materials promoted virtually every function of instant color photography—its commercial use in advertising; its industrial uses in business and science; its popular use among amateur consumers—except as an aesthetic object. The 20 x 24 marked a turning point in the company’s rhetoric, which began to emphasize color photography’s role in art-history research, and then in fine art. In 1979, Polaroid organized an exhibition of 20 x 24 works featuring 18 artists, including Andy Warhol and Chuck Close. Photographer and critic Gary Metz contributed an essay to the catalog, in which he heralded the 20 x 24 as “a sort of reinvention of photography,” offering artists the same thrill, and sense of discovery, that their predecessors had felt with the first daguerreotypes. “In the rhetoric of their tremendous size, their iridescent color, their formidable optics, their promiscuous topographic completeness—in short, their utter physicality—the 20 x 24 pictures recover and extend the first moments of photography’s public history. It is as if we have the opportunity to start all over again,” Metz wrote. “This first work represents, in the best and fullest sense of the word, research.” He ended on a note almost of admonition: “It remains to be seen whether artists can be as sophisticated in their work as the apparatus itself.” In later promotional materials, Polaroid called the 20 x 24 nothing less than “a new medium” in itself.